This topic contains 30 replies, has 9 voices, and was last updated by Darkest Star Games 4 months, 2 weeks ago. 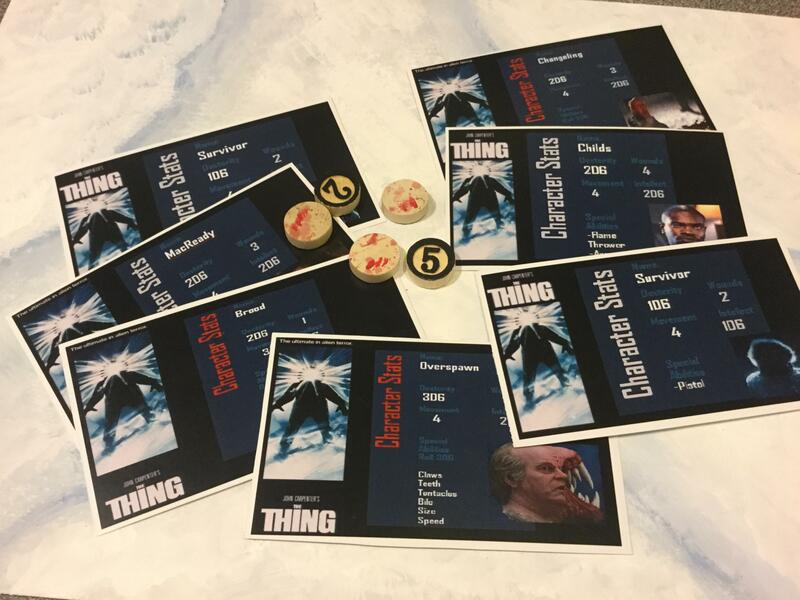 Alright, so I love the movie “the Thing”. I actually enjoyed all three versions. I have decided to start a new 15mm project based on the Carpenter movie. This will be a solo experience. The first miniatures I ordered were from Khurasan miniatures. They are pretty good versions of the movie characters. I also ordered some Cthulhu monsters as stand in for the aliens. 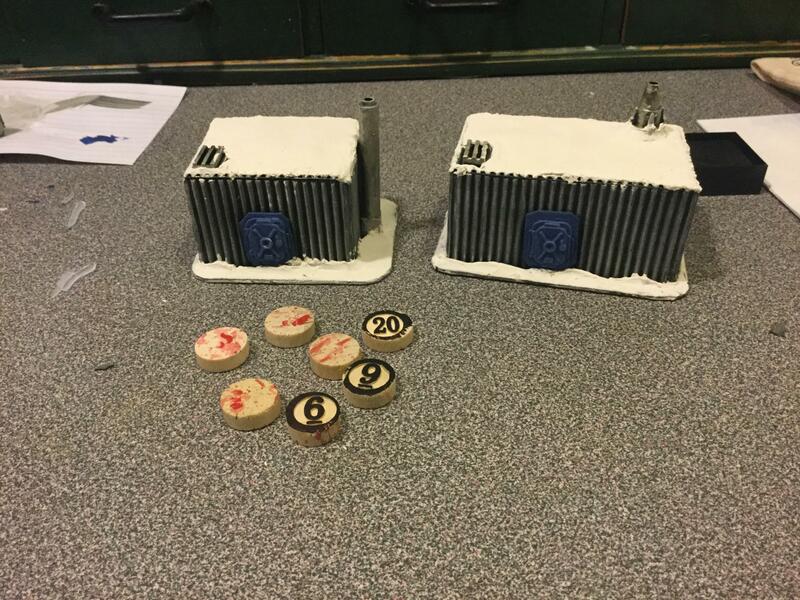 Here are the pics from the website. 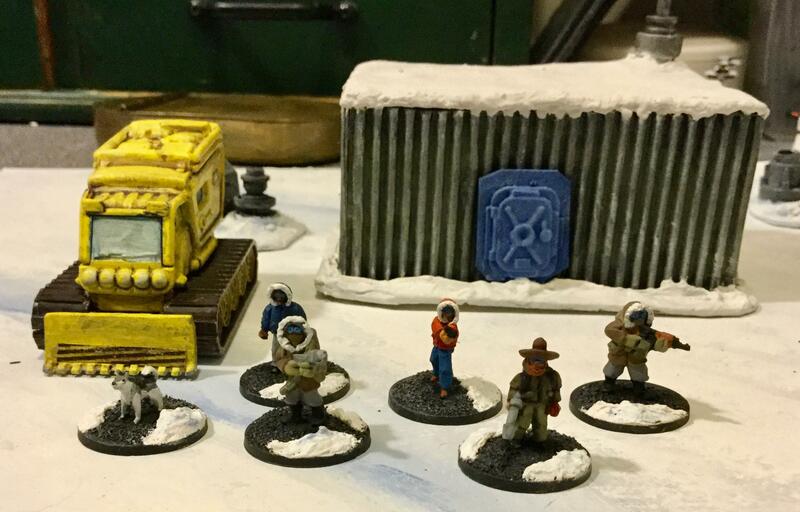 I have decided to use a wallless system to mimic the corridors in Outpost 31. 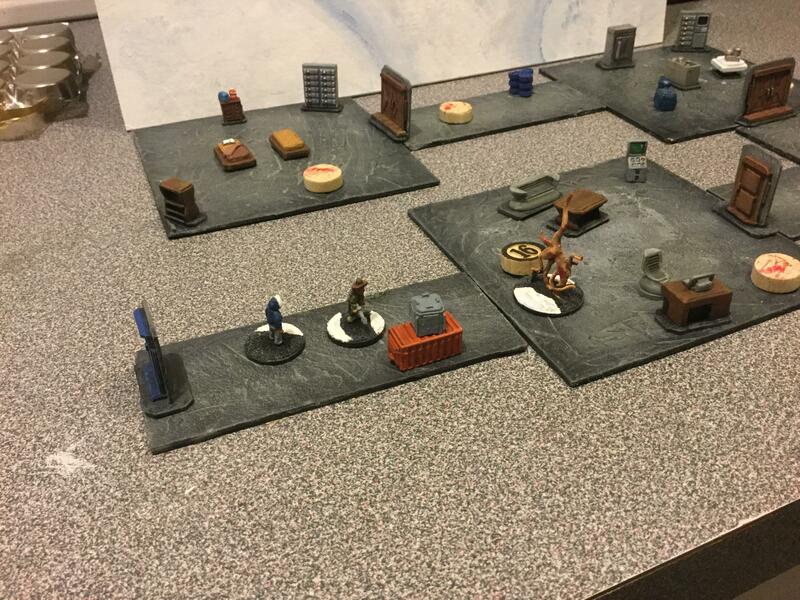 I have lots of scatter terrain like crates and barrels. I need to design some specific rooms like the radio room and the kitchen. They will be very basic but I think they will feel right. I also bought some numbered tokens for individual encounters. Something to keep the AI interesting. Finally I am going to make a couple of storage container buildings for any outside encounters. 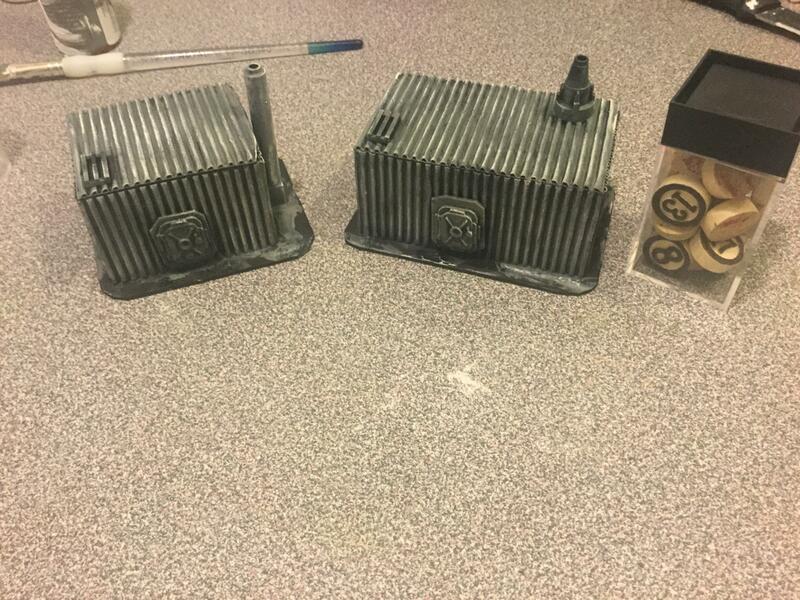 I’ll just scratcbuild some basic boxes and glue some bits of greebles on the outsides. Here is my progress so far. . . This topic was modified 5 months, 2 weeks ago by OldBen1. I like those sheds. 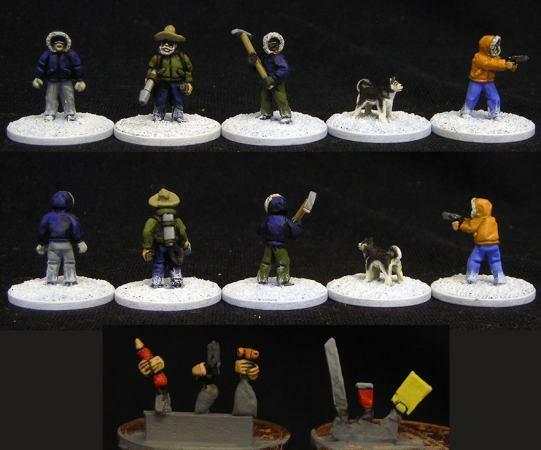 The minis looks good, contrast with the snow and I like the snow on their legs and shoes. In my other hat (Editor of Miniature Wargames) I’d really like to feature some of what you are doing. Drop me a line if you are interested. Sure John, how do I contact you? Just working on some character cards. This reply was modified 5 months, 2 weeks ago by OldBen1. Worked on some modelling last night. 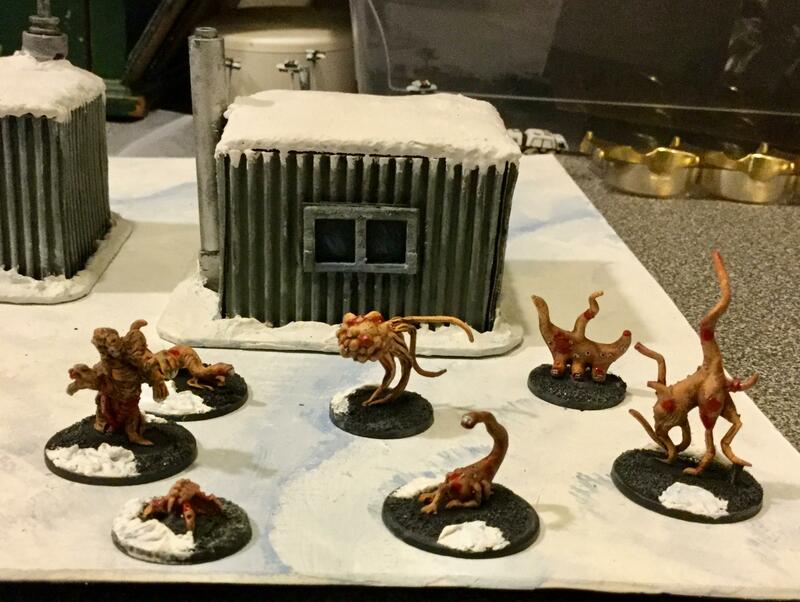 Added some snow to the sheds to make them look a little more like the outbuildings in the thing, mine look a little more futuristic. Oh well. I still need to add some ink shading and paint the snow. A light blue, and some white highlights. I also added some blood spatters on my tokens and finished off the character cards. Worked on some more rules last night. 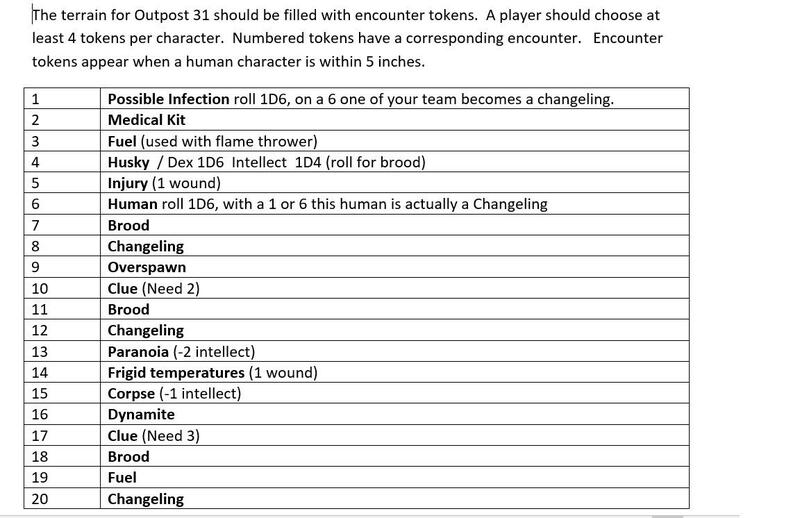 I want to allow the aliens a randomized set of characteristics. I also want the aliens to be able to infect survivors. 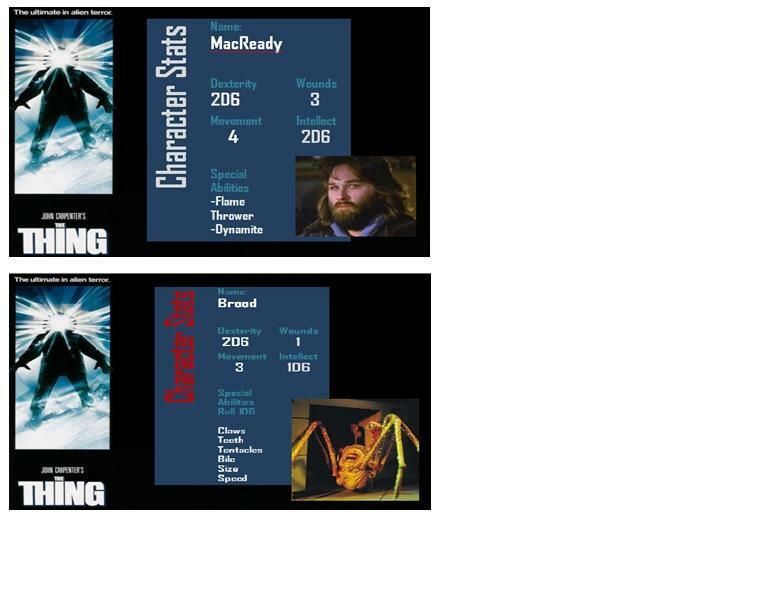 I am going to split survivors into heroes and minions with Childs and MacReady as the main characters. I had a set back with painting my sheds as my paint was kind of dried out and lumpy. I’m going to have to figure out how to smooth the top. Apparently my miniatures are on the way! Finished the small outside board. Most of the action will take place inside though. You had me thinking those were hills on the board, nice painting. Also nice reuse of terrain, if not for the antenna dish I wouldn’t have recognized them. 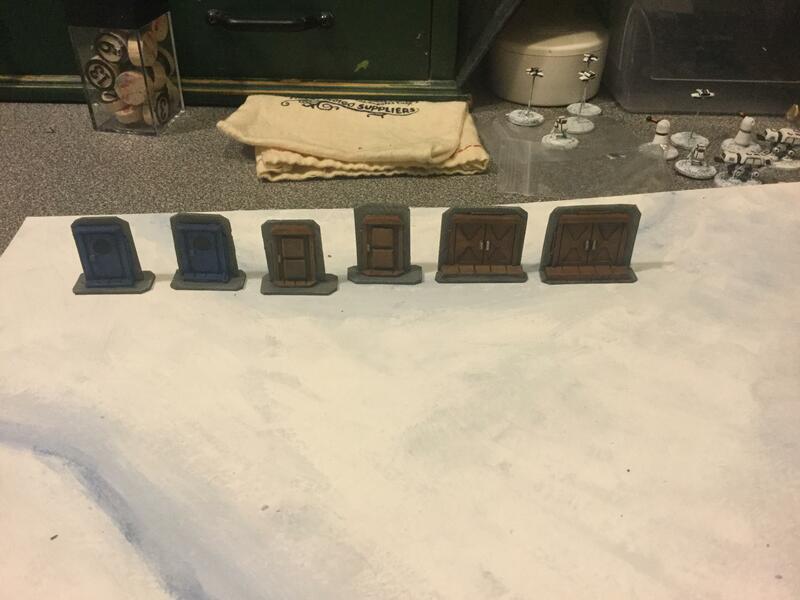 Finished some GZG doors for the inside of Outpost 31. This is shaping up very nicely! Finished the token table. The scenarios will be based on random token placement. 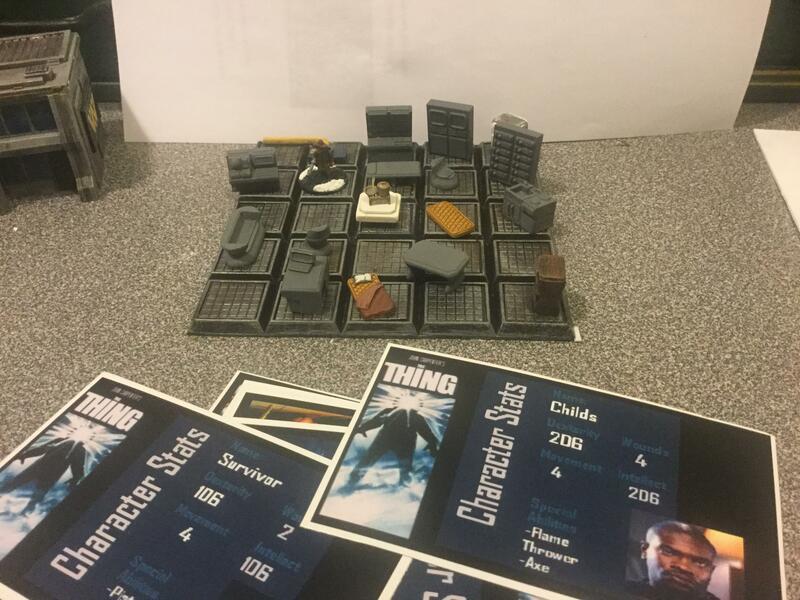 I think I can use the tokens for other games as well like Star Trek or Aliens. 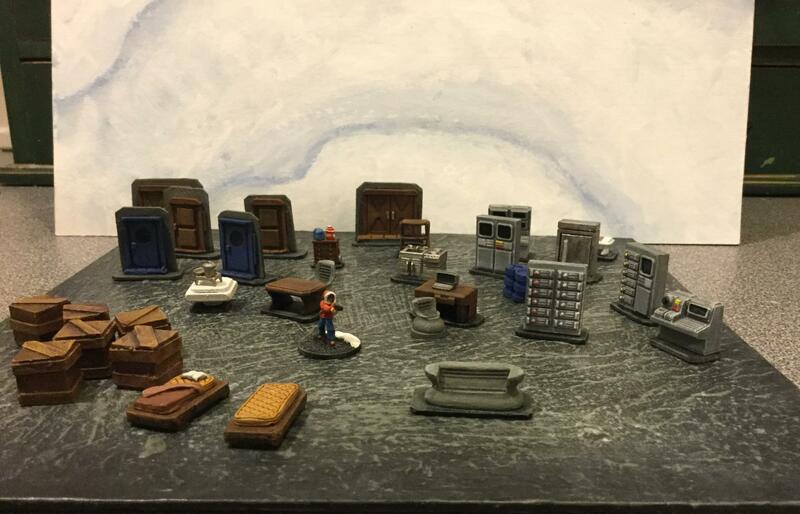 Still waiting for the Thing miniatures, which will include some of the terrain items I need like computers and desks and kitchen stuff. Miniatures . . .Canadian postal strike has slowed them down. It’s tough because there are also some terrain as well. I guess I can start playtesting with other miniatures instead. Well I finished some minis this weekend. Now to be fair I am not a good mini painter. These minis were really awful to paint. I like Khurasan miniatures but these minis lacked a lot of detail. It’s hard especially with the parka fur around the head. Oh well, here we go. I will take better pics later. 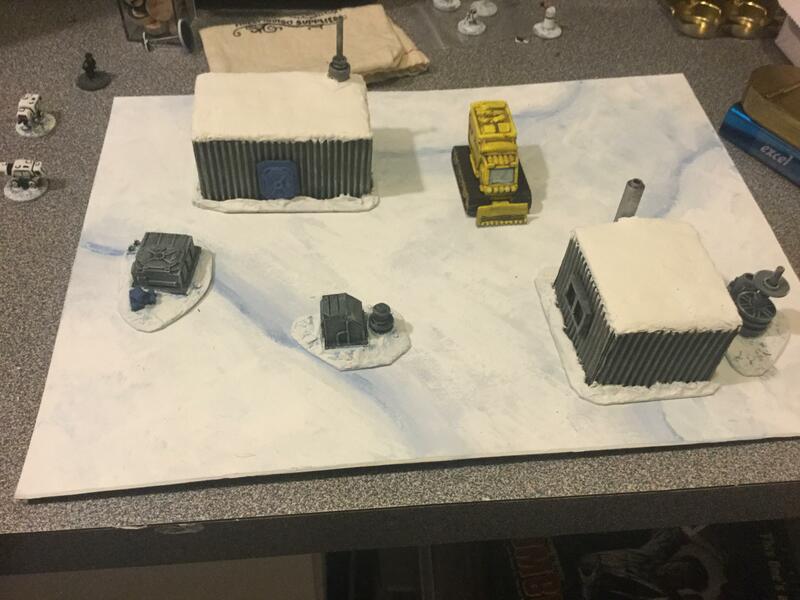 Since a lot of the action is inside I painted the bases snowy and floory. I have some more basework and maybe some small details. Not my finest work but I can wait to play some scenarios! This reply was modified 5 months ago by OldBen1. Those ‘villainous’ Things look absolutely, disgustingly gross! – and I mean that in a good way! I think the human characters look pretty good from your photos – wouldn’t worry about the painting – just how much can you do with a parka, hood and goggles, anyway….. Thanks. There is literally no detail on the faces. Sometimes I forget how small these miniatures really are! All depends upon what sculptor he buys the masters from. At one point he had minis from 18 different sculptors, have no idea what the count would be now. Makes consistency a bit of an issue. I think you sell yourself short, good sir! They look great and I’d be moire than happy to play with them any day! Sorting out the furniture, I am going to base everything separately so I can use it in some Department games I plan for next year. They are all from a Khurasan. I’ve got them primed but I have to think of a color sch3me for the very sci fi chairs. I also printed out my character cards. Finally finished the scenery, what a chore. I like painting buildings but small tables and chairs, no thank you! Nice work on the furniture and the cards look very professional. Oh yes, this is looking fantastic!